SkyBlade High Volume Low Speed (HVLS) Fans are specially designed fans with leading edge STOL technology. STOL Series 12-24′ Fans deliver top efficiency to heating and cooling systems by reducing run time, cycles, and improving overall comfort. 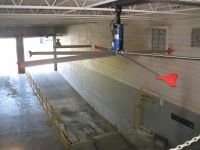 STOL technology created our blade design allowing us to accomplish moving more air with less energy. This saves users money operating heating and air conditioning systems less frequently. Reducing the need for heating in the cold months through de-stratification of heated air and increasing air velocity to assist air conditioning systems in warm months. 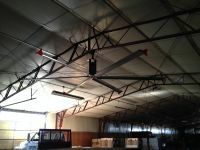 SkyBlade Fans are utilized in high ceiling facilities, open office spaces, warehouses, places of worship, gymnasiums/work out facilities, auto dealerships and more.